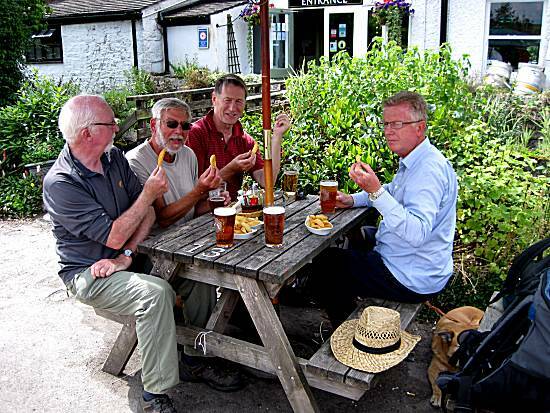 Five eager walkers, plus Neil in his milk bottle, arrived in the market place at Middleham and after finding suitable parking places queued neatly behind Cliff's car waiting patiently to be allocated their excellent butty rations, with home made sausage and added egg. 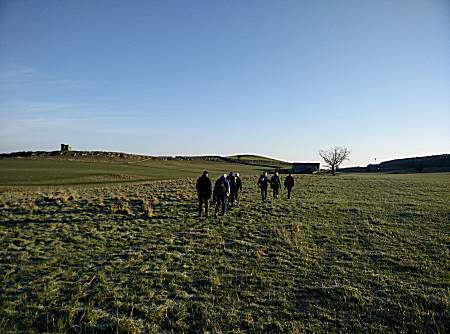 After breakfast they set off at great speed taking a pathway passed the famous castle, selecting a route up towards the 'gallops'. 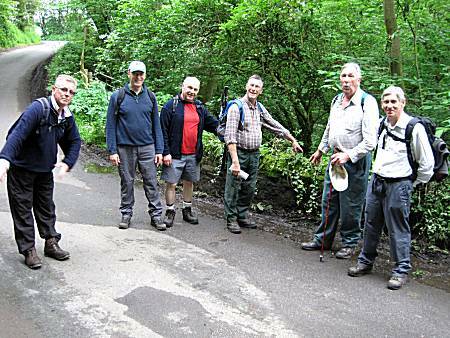 The walkers were relieved to find that Colin had presented himself in a clean shaved and respectful condition (unlike the previous walk). 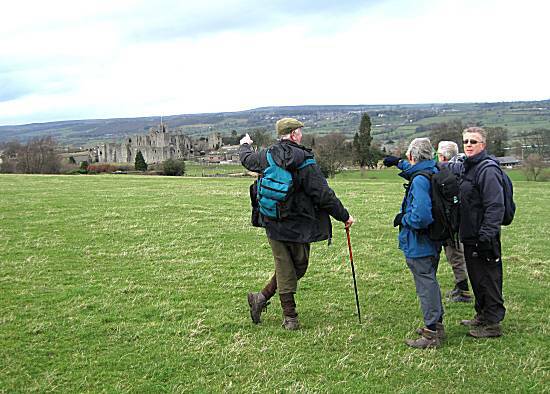 The walkers marvelled at the ruined castle and wondered how it had survived the recent high winds. 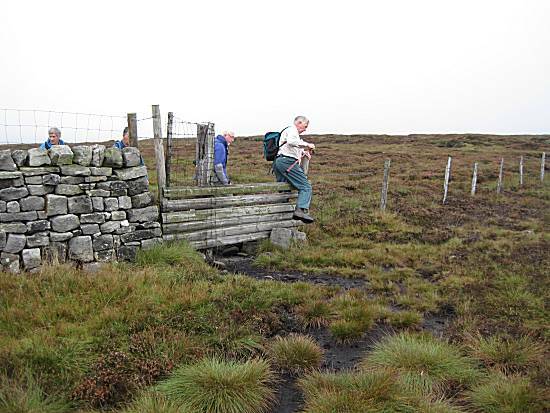 The walkers found difficult hills, but bravely continued at an amazing pace, knowing their route would take them into unknown areas with strange bridges. 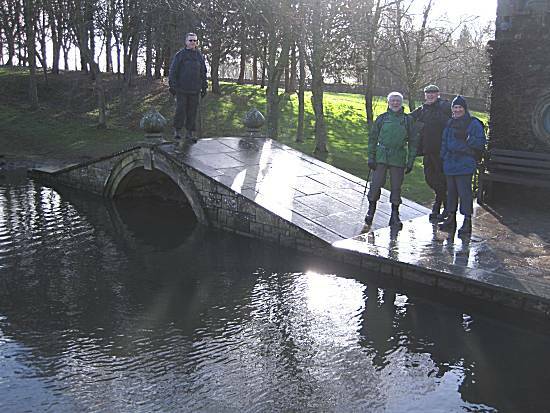 Using their advanced navigational skills they accurately located the giant Tupgill Park having a large lake with unusual bridges. 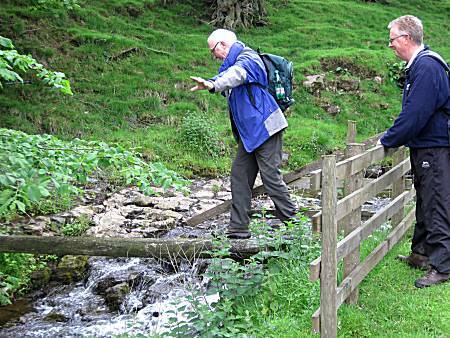 Only Ron was brave enough to attempt to cross the bridge, due to the very slippery stones. 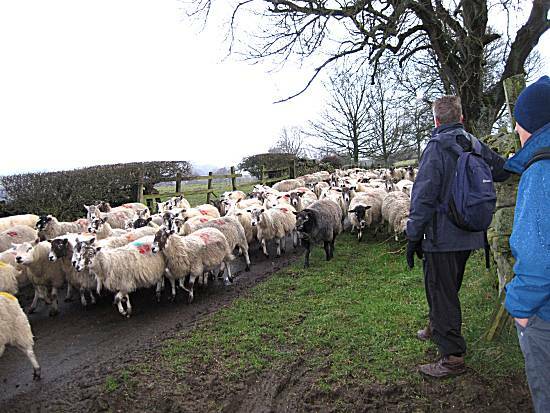 The walkers were horrified to see a flock of stampeding sheep heading towards them at great speed. 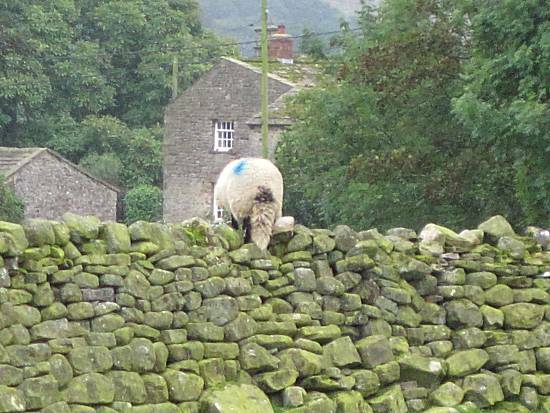 Fearing for their lives, they cunningly hid in a gateway using special sheep avoidance signals until the danger has passed. 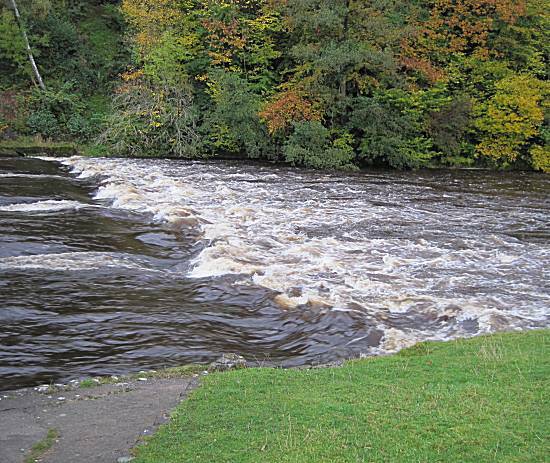 They were grateful that their advanced survival skills had again saved them from a horrible death. 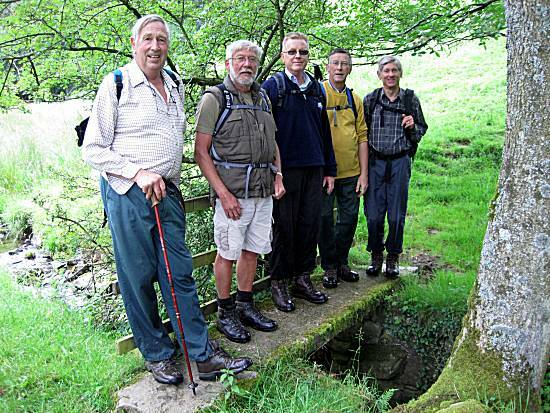 After the extreme dangers had passed, the walkers quickly stopped to share portions of neatly cut Pork Pie, courtsey of Colin, followed by Mars Bar crispies. 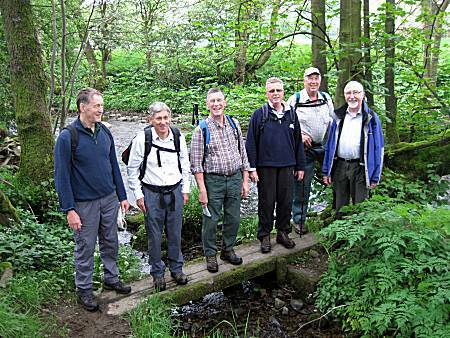 Feeling greatly calmed they felt able to continue their walk, soon reaching the village of East Witton, where they selected a footpath toward the fast flowing River Cover and the relative safety of the Coverbridge Inn. 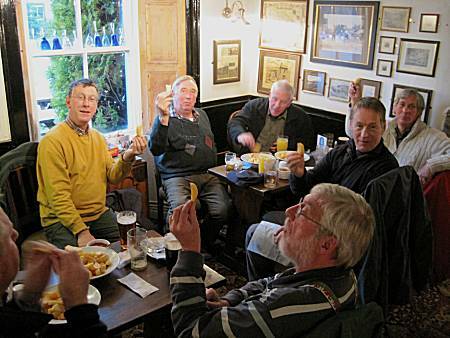 The walkers quickly settled in at the Coverbridge Inn, enjoying excellent ale and ordering generous portions of nourishing chips. 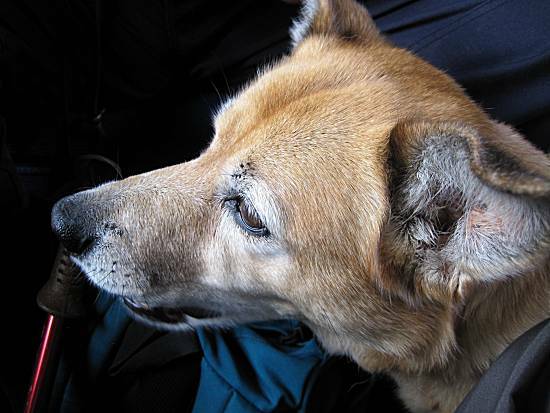 They were tempted to stay too long, but settled to leave after only 2½hours. 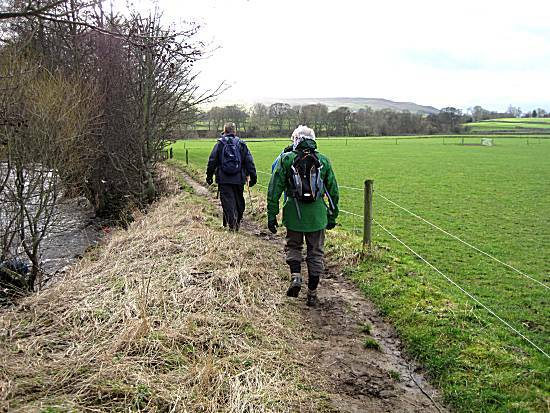 The walkers selected the river route towards Middleham, but were greatly concerned by the incredibly fast flowing water. 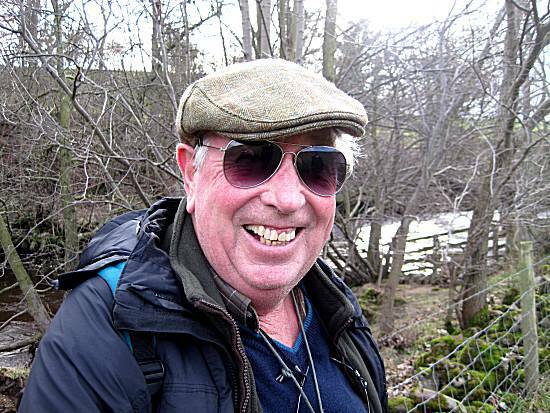 Cliff was unable to hide his delight at finding an excellent pair of sunglasses that had been left by the locals for him. He was suitably grateful. 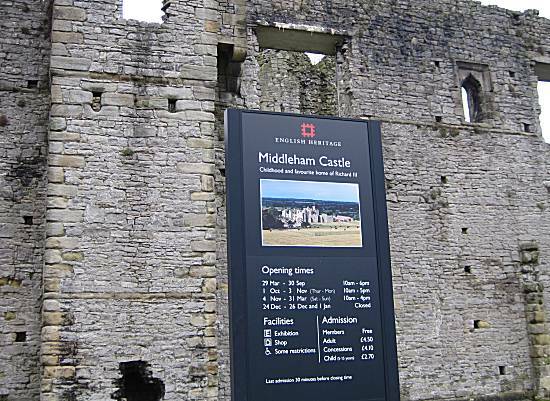 The walkers were quick to spot Middleham Castle, indicating that a successful completion of their walk was within their grasp. 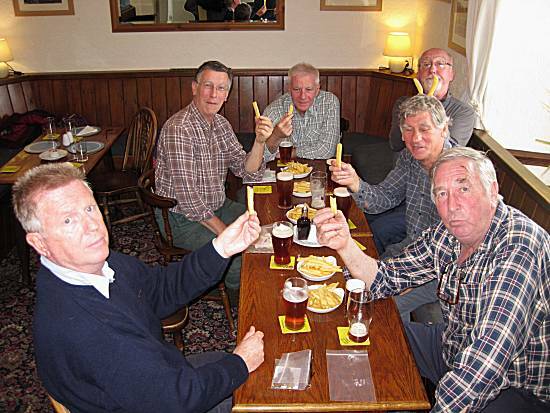 They therefore stopped to celebrate, by sharing their remaining Mars Bar crispies. 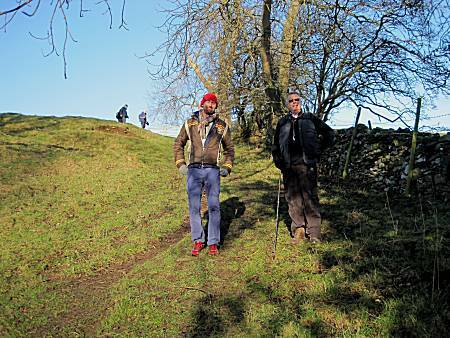 Afterwards they hurried down the hill into Middlehan town and their awaiting cars. 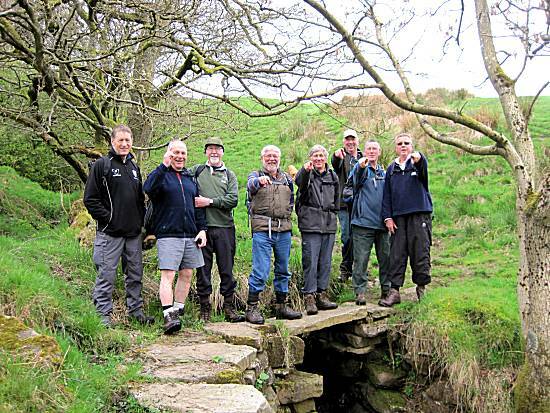 The walkers rejoiced at the completion of yet another successful walk and left in high spirits having agreed to meet again for a further walk. 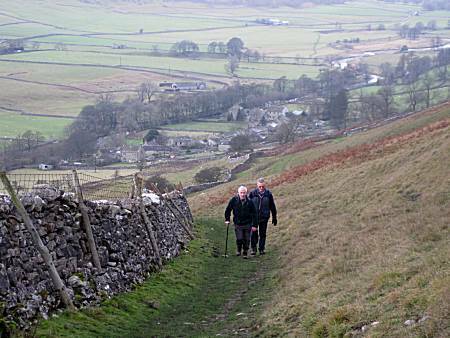 Weather: Damp and muddy underfoot, with heavy drizzle during the morning. 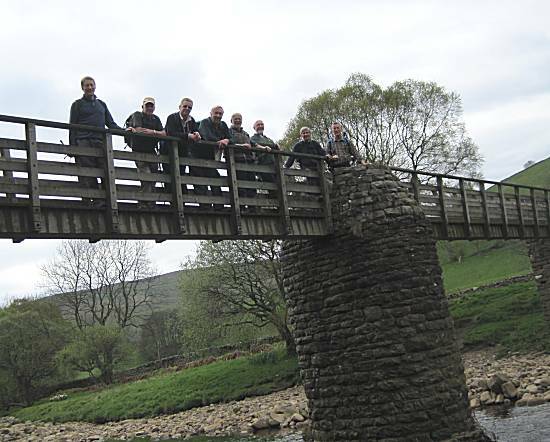 Nine walkers, plus Neil in his milk bottle, arrived close to the village of Thwaite in deepest Swaledale, intent on locating all the long lost bridges in the area. 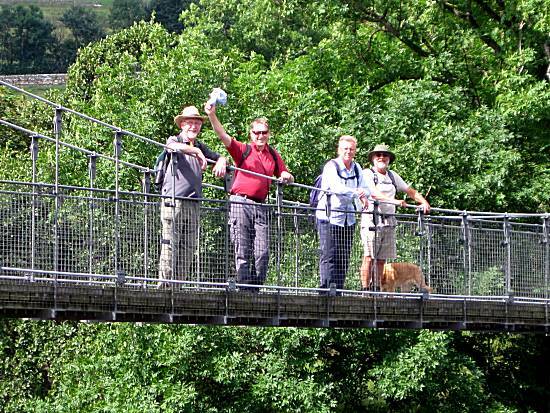 After incredible bridge sustaining bacon, sausage and egg butties, courtesy of Cliff, they set off at great speed in anticipation of success. 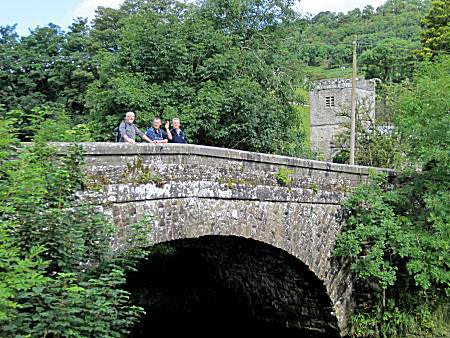 Bridges were located, conquered and recorded at an incredible speed, much to the amazement of the onlookers. 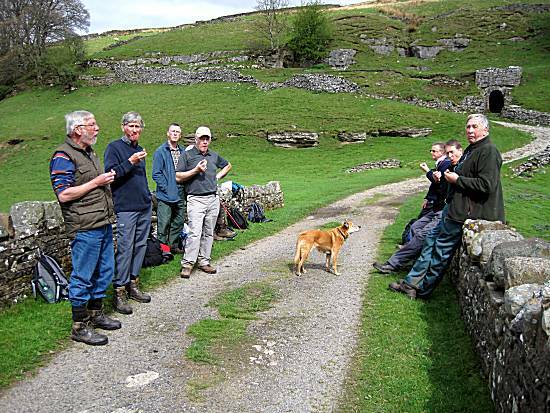 After their unbelievable performance the walkers stopped for Pork Pie refreshments, as Ella looks on, checking to make sure that all the pie was consumed. 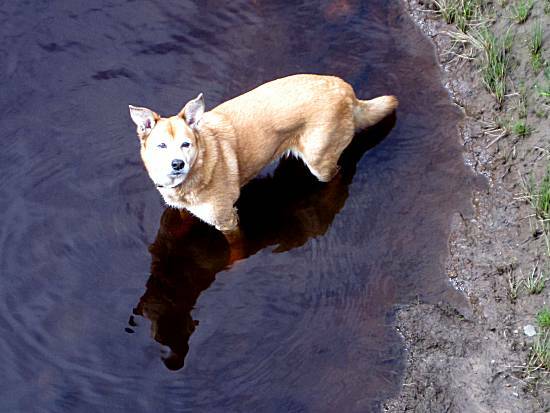 The blistering pace of the walkers was nearly too much for Ella, but using her instinctive doggy skills, she cunningly cooled herself. 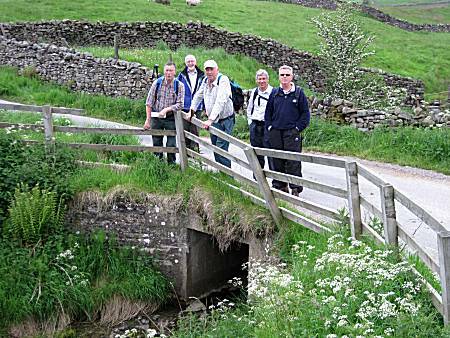 The walkers were quick to locate the 'Farmers Arms' in Muker, where much Black Sheep ale and nourishing chips were enjoyed. 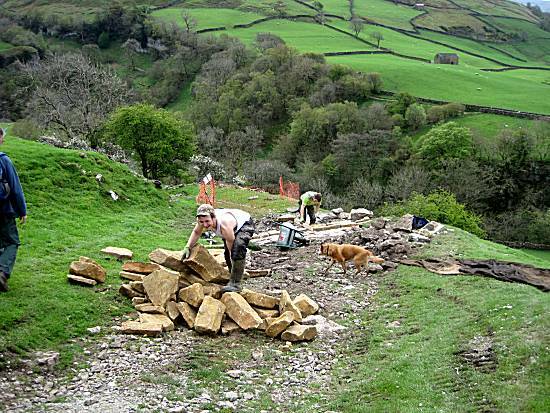 The walkers were humbled to find the locals rebuilding a treacherous pathway, thus ensuring their safe passage in the difficult conditions. The walkers were puzzled by the unusual transport used by the locals, but chose not to interfere. 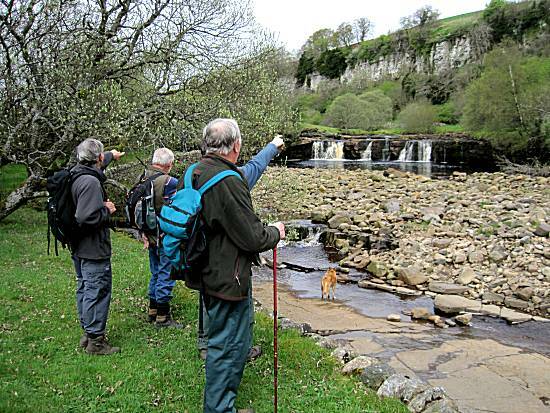 The walkers could not believe their incredible skills, when they rediscovered yet another long lost waterfall !!! 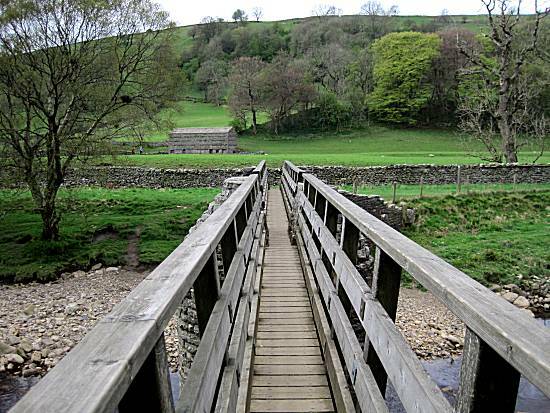 Weather: Dry and pleasantly warm all day with some hazy sun. 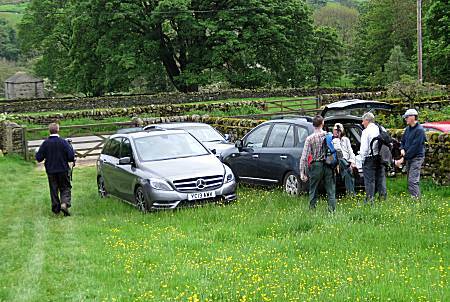 Seven brave walkers, arrived at Gammersgill to park in a field especially reserved for the walkers. 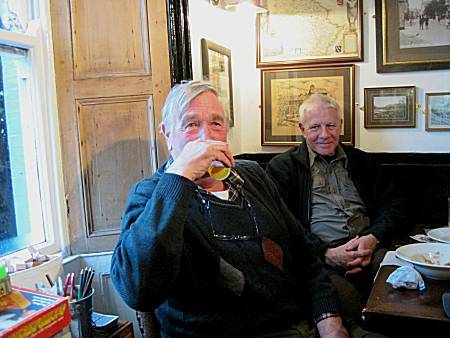 Ron shared out his incredibly powerful sausage, bacon and egg butties, before Tom arrived late, but full of apologises. 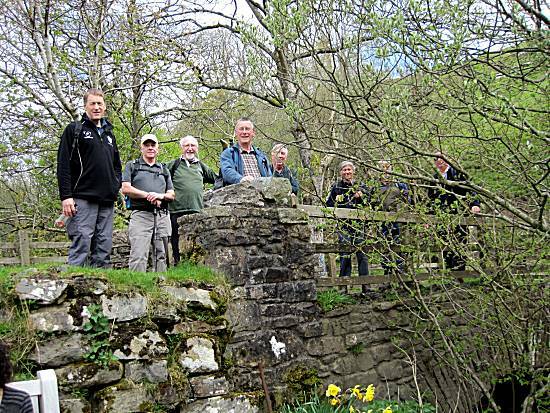 Mission: The local villagers of Gammersgill were most concerned that they appeared to have mislaid a bridge and had asked the brave walkers whether they could find it for them. 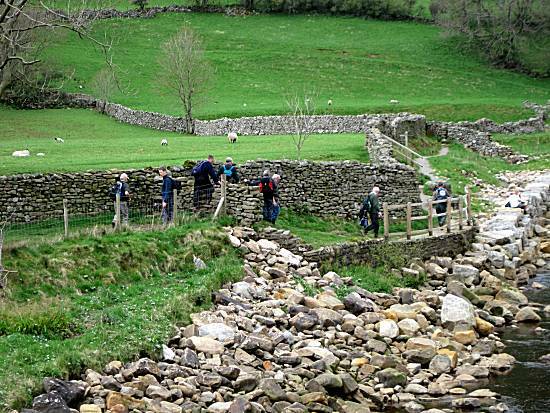 The walkers knew that this would be a very difficult and dangerous task, but agreed to assist the troubled villagers. 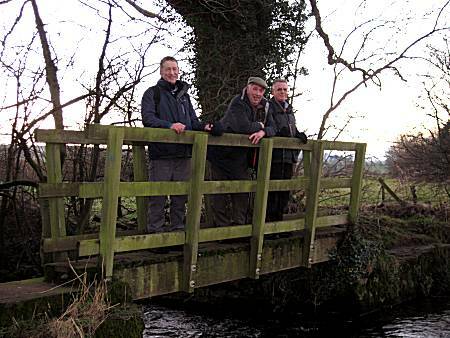 They quickly formulated a cunning plan, of locating all the bridges in the area and counting them. 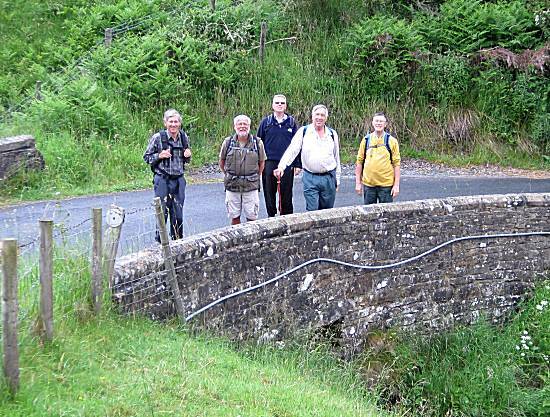 The walkers realised that their bridge locating skills could be enhanced by carefully administering adequate quantities of pork pie and mars bar crispies and quickly stopped to carry out this function. 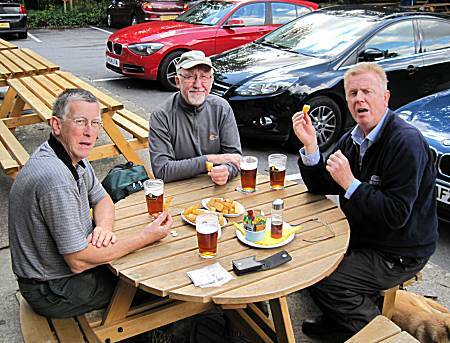 Still unable to locate the missing bridge, the walkers stopped at "The Foresters" in Carlton for Black Sheep ale and nourishing chips. 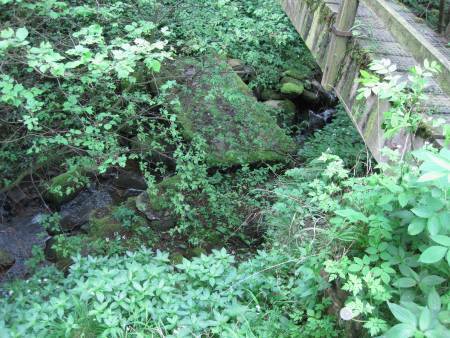 Here they considered searching a lonely and desolate area only accessible by a dangerous bridge. 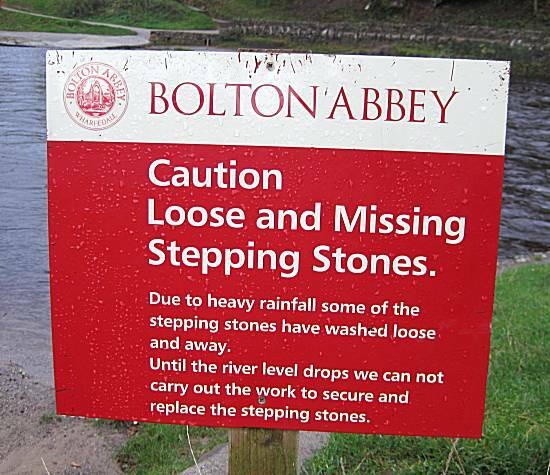 Although the locals warned them against this, they unanimously agreed to attempt this impossible task. 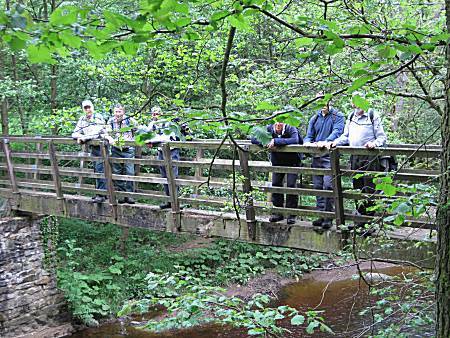 Whilst recording yet another bridge, Paul pointed out to the other walkers a strange sight below!! Triumphantly, the walkers returned to their cars after yet another successful mission. They declined gifts from the grateful locals and left for their homes. 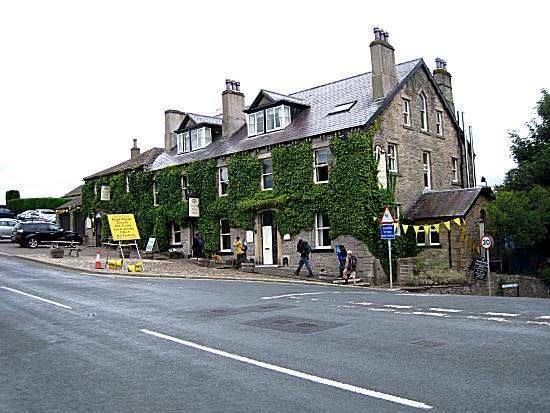 The walkers, arrived at Cliff's house at 8:45 in response to a desperate request for assistance from the locals, who were much troubled by the loss of one of their public houses, known as the Palmer Flatt Hotel, which was last seen near Aysgarth. 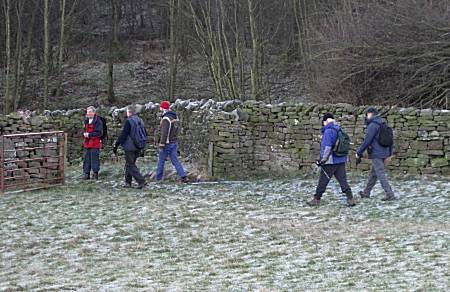 The brave walkers vowed to attempt a locate the missing pub, but realised that this would prove difficult without bacon butties. 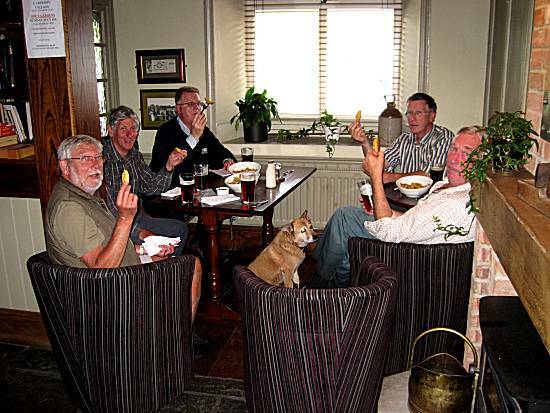 Cliff invited them into the rear garden where, much to their great appreciation, they were all served excellent full English cooked breakfasts. 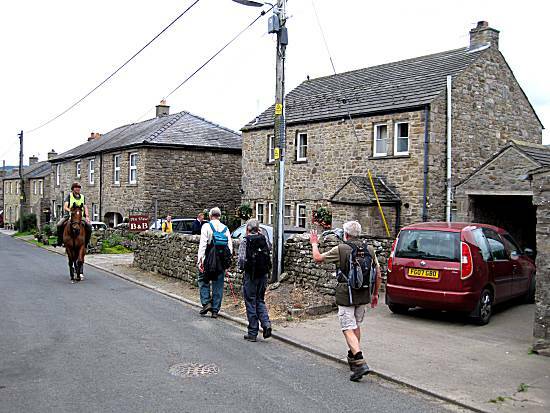 After their amazing breakfasts, the walkers set off through the village and started their accent of the first steep hill. Realising that the amazing speeds might affected their balance, they cunningly took the necessary actions. 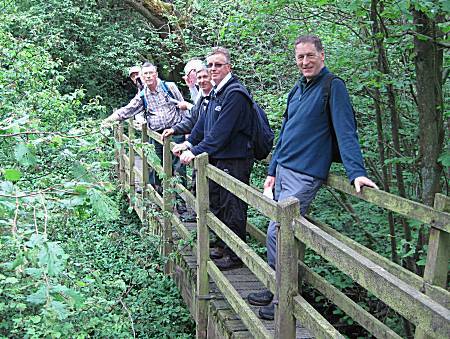 Skilfully the walkers negotiated a dangerous ravine in their endless search for the missing pub. 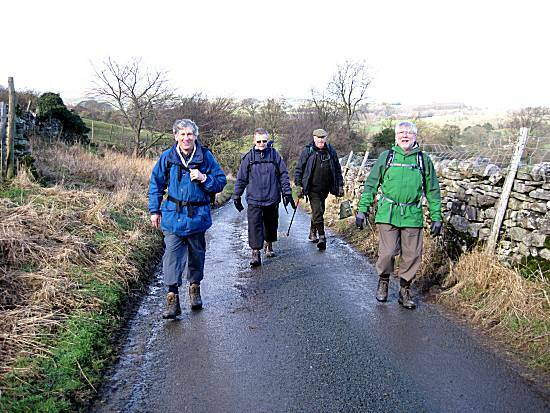 They soon realised that they had been walking for nearly half a morning without sight of any pubs and therefore cunningly decided to stop for pork pie and mars bar crispies, which they instinctively knew would enhance their performance. 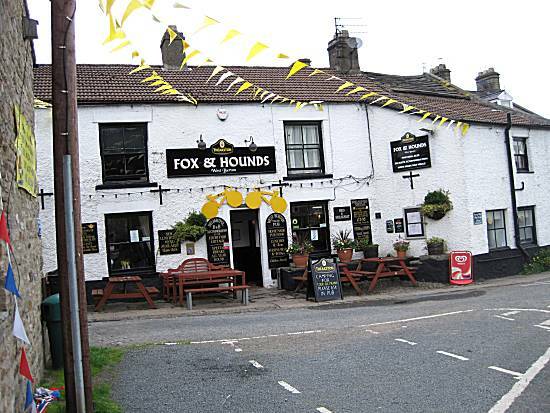 Arriving at West Burton the walkers were relieved to see that the Fox and Hounds was still in its original location, but were humbled to see that this and some of the local houses had been decorated with bunting and yellow bicycles in recognition of their historic visit. 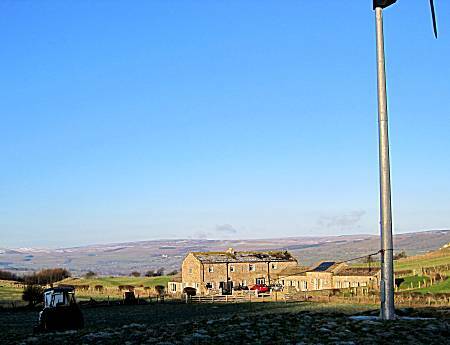 The walkers were amazed to find that the interior of the hotel had been transformed into a warm and welcoming area. 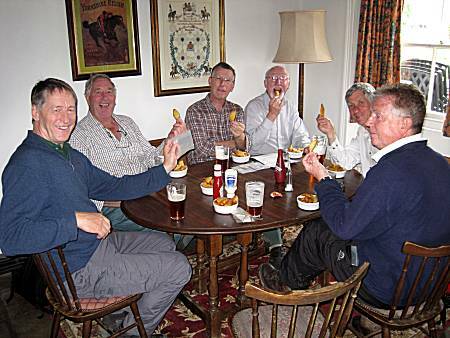 They relaxed in the comfortable surroundings and enjoyed "Main Line" ale, whilst being served giant portions of nourishing chips. 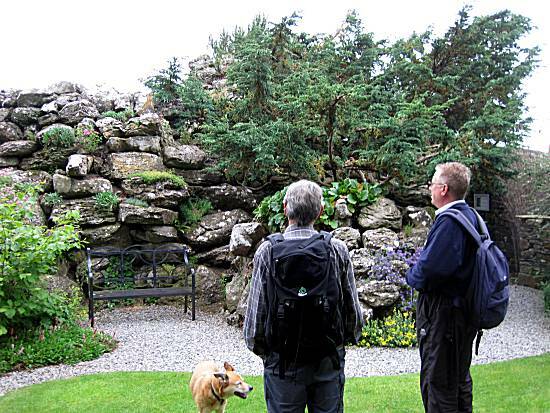 Leaving the Aysgarth Falls Hotel, the walkers paused briefly to acknowledge the crowds of grateful well-wishers that were anxious to show their appreciation, but they hurried to investigate the nearby Aysgarth Edwardian Rock Garden, to enhance their incredible knowledge of the area. 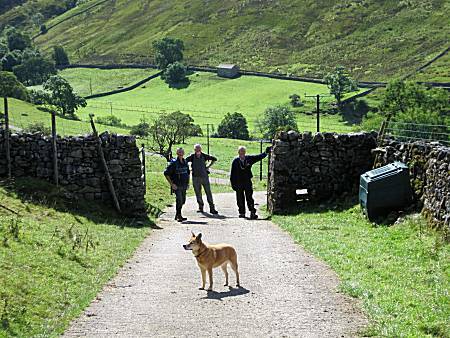 The walkers cunningly selected a scenic, but obscure route back to Thoralby to avoid the crowds, but were grateful to see that the locals had provided mounted guards to ensure the security of their cars. Weather: Warm but overcast much of the day will a little fine drizzle at times. 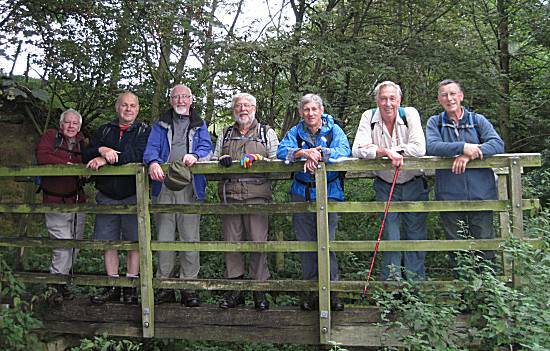 Walkers: Paul (Leader), Colin, Andy, Cliff, Alan, Ron and Ella the dog. 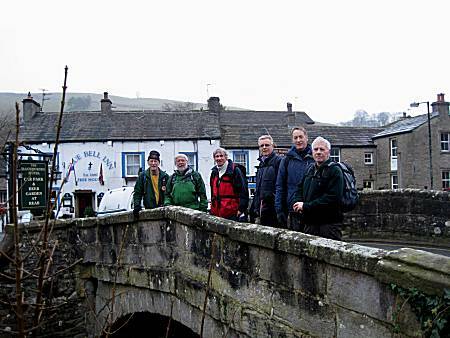 The walkers, arrived in the warm sunshine, at 8:30 in the Market Place, Reeth, eager to devour Ron's excellent Bacon and Egg butties. 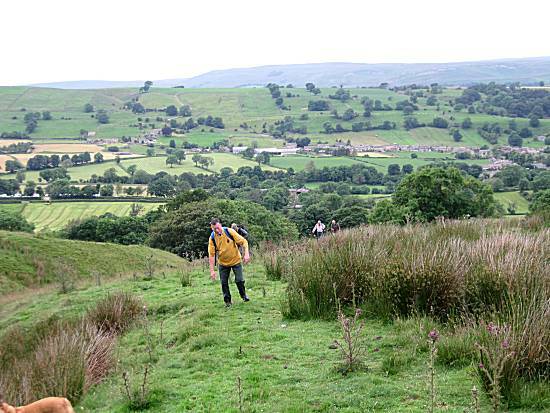 They set off leaving the village in a new direction heading towards the dreaded Fremington Edge. 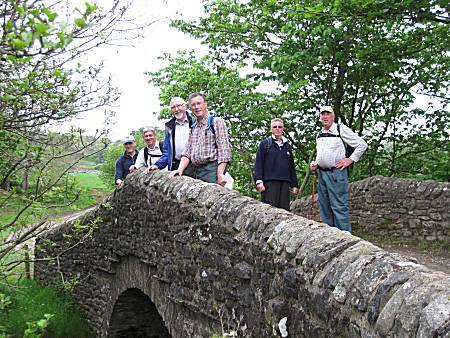 The walkers were relieved to learn that the locals had not mislaid any bridges or pubs and welcomed the walkers with yellow bunting and bicycles!! 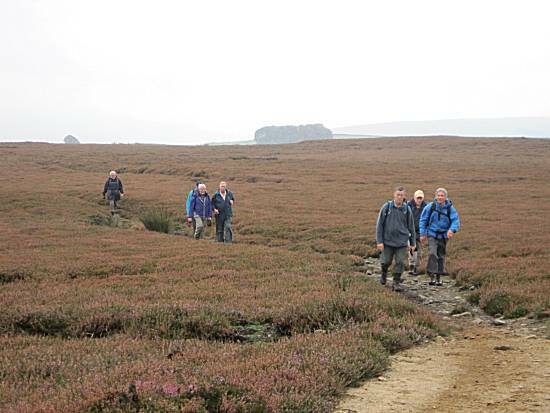 The climb to the top of Fremington Edge proved difficult in the heat of the morning, but the walkers were not deterred. 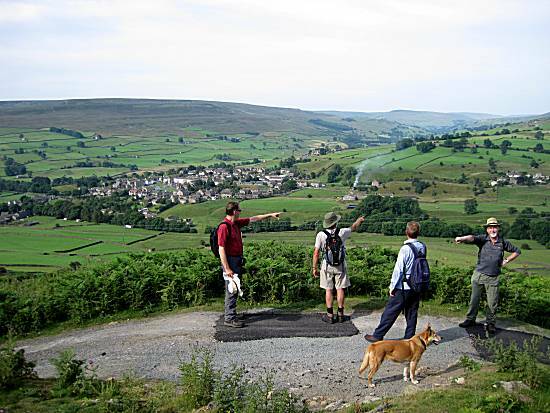 Looking down from the top toward Reeth, the walkers were unable to agree the best route to Marrick Priory, but it was obvious that only Ella knew the correct direction. 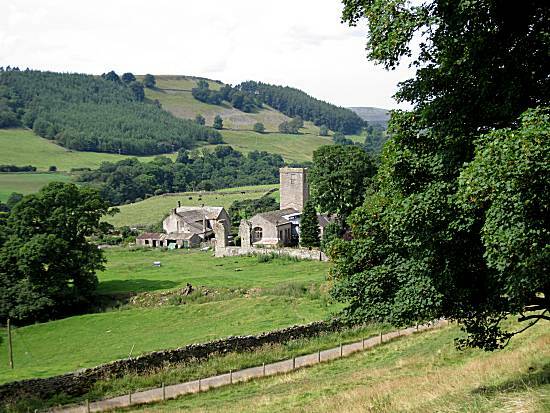 DISASTER OCCURRED - When walking through the village of Marrick they realised that the friendly Ice Cream shop had closed. 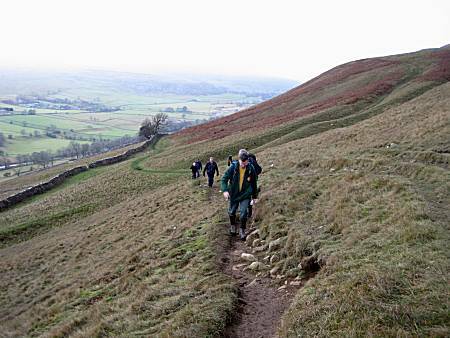 The walkers had to continue without the benefit of Magnums. 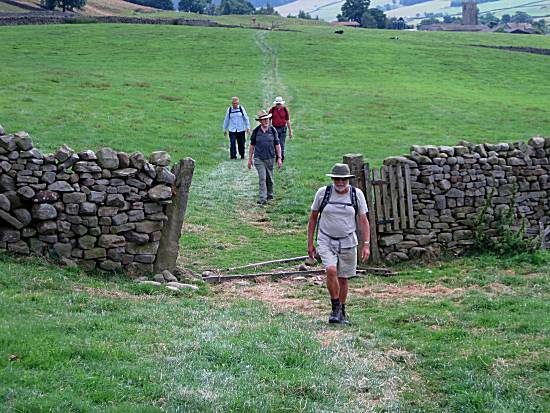 The walkers can be seen in an exhausted state near Marrick Priory, but they know that the benefits of the Pork Pie will soon kick in. 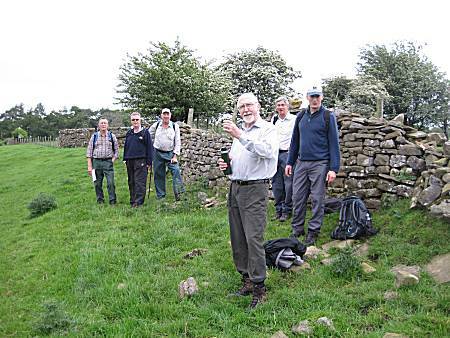 After the Pork Pie, the walkers set off at great pace towards their planned lunchtime stop at Grinton. 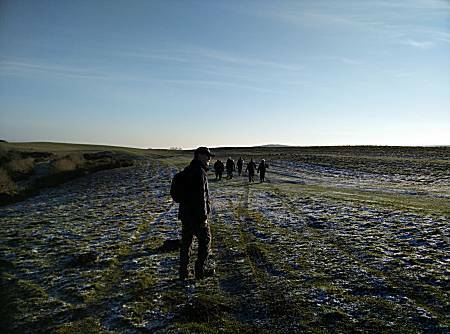 The walkers marvel at Fremington Edge, knowing that they had passed the white house earlier that morning. 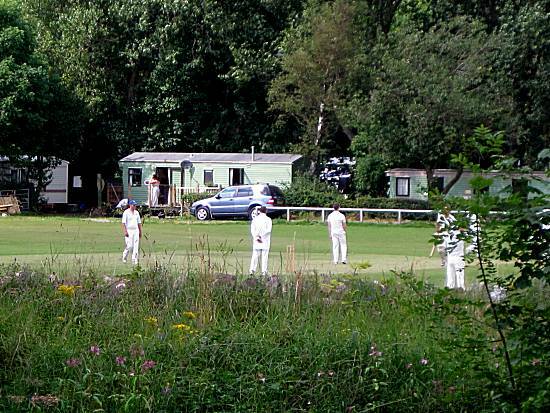 They also secretly observed the locals for some time as they occupy themselves hitting a ball around a field. 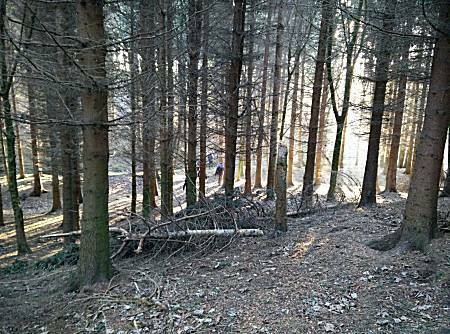 The walkers chose to ignore their strange activity. 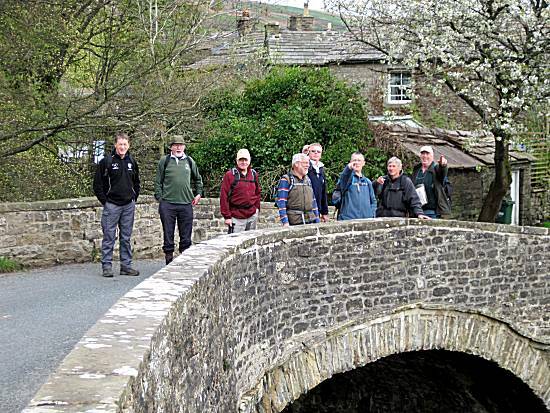 Leaving Grinton they set off towards their cars at Reeth, but are crucially aware that there will be no way of crossing the river. 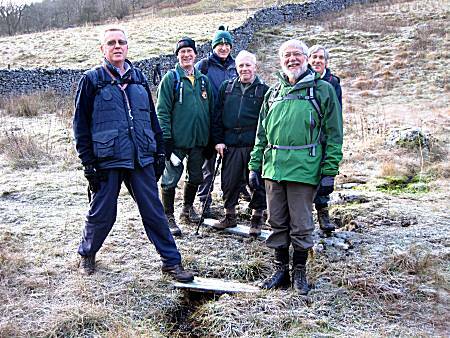 However, the walkers have a cunning plan!! 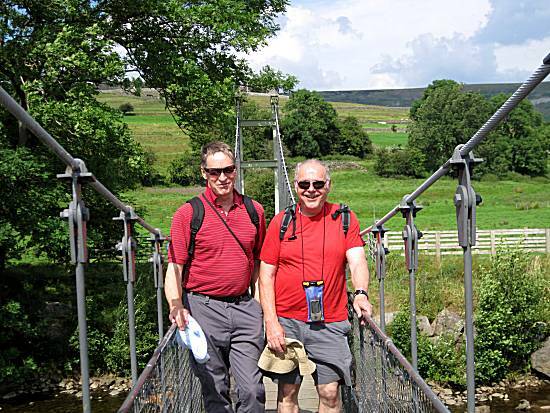 The walkers accurately locate the Reeth Suspension bridge, knowing that it was rebuilt in 2002, thus saving the walk. 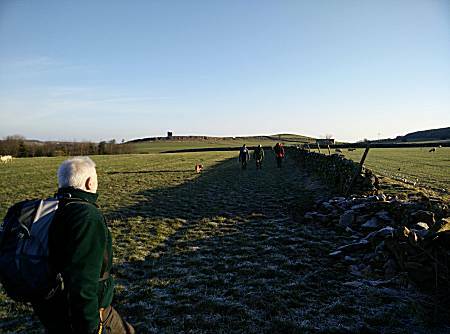 The walkers are pleased with their incredible performance and arrive back at their cars after yet another groundbreaking walk. Weather: Very Hot sunshine all day. 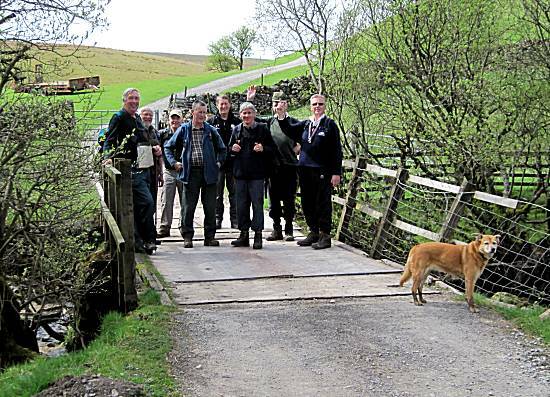 Walkers: Andy, John, Alan, Tom, Ron and Ella the dog. 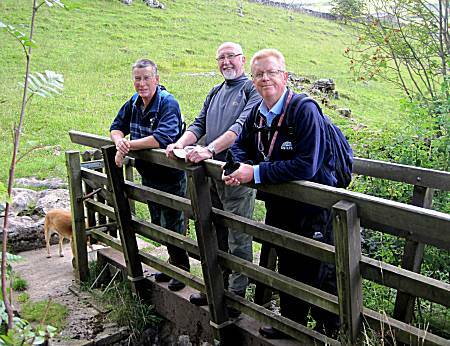 Just four walkers arrived at the side of the road in Starbotton ready for a difficult day's walking. 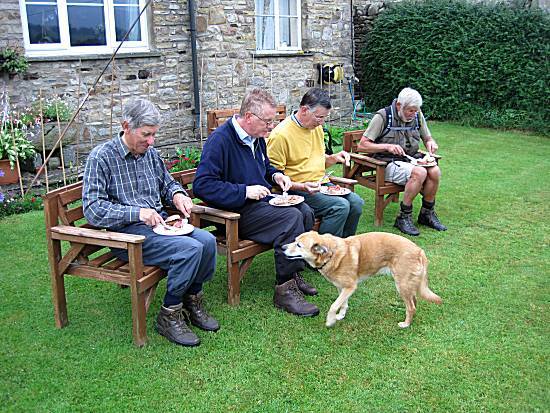 Ron's brilliant bacon, egg and sausage butties were welcomed by the walkers and Ella the dog. 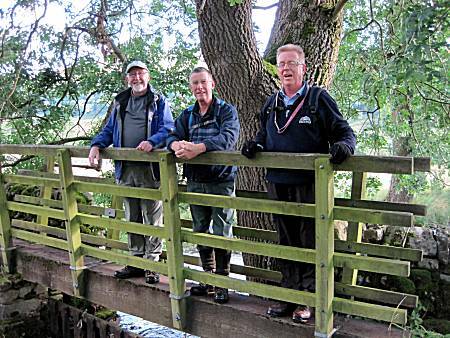 Quickly they set off towards the river and enjoyed the pleasant surroundings in the warm conditions, but were acutely aware of their mission to locate yet more bridges and churches. 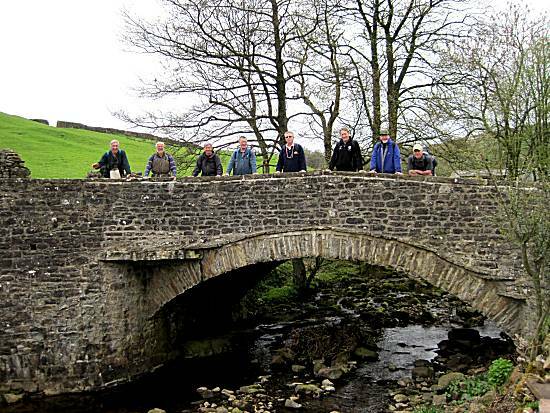 Using their incredible skills, the location of several further bridges were soon discovered. 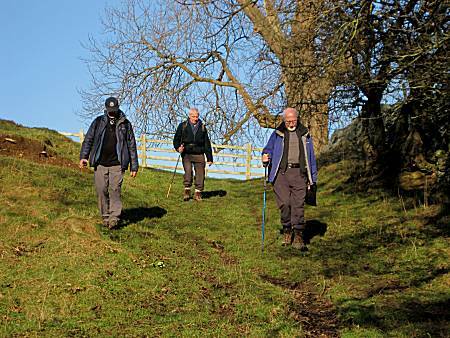 As the walkers continued their search, they stopped totally mystified by the elusive church. However, Ella remained confident that she knew precisely where the church was hidden !! 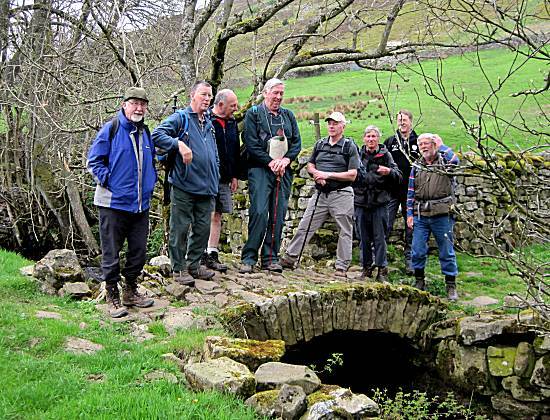 With the added strength of the Pork Pie, the walkers successful located the St Michael & All Angels Church, which had cunningly been hidden in Hubberholme. 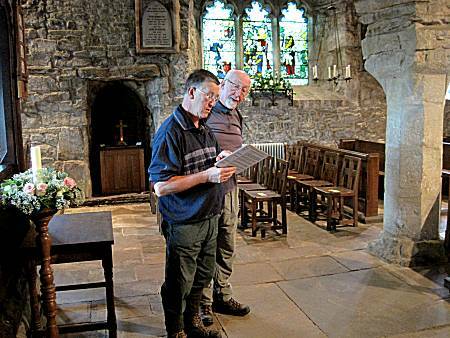 Paul and Tom rushed to cram information about the 12th Century Norman church, much improving their knowledge. The locals were greatly impressed. 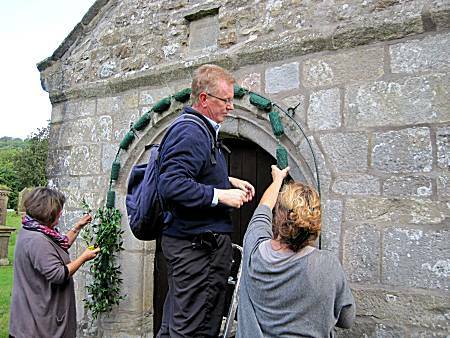 The walkers were humbled as the locals insisted on decorating the church in recognition of the amazing discovery. 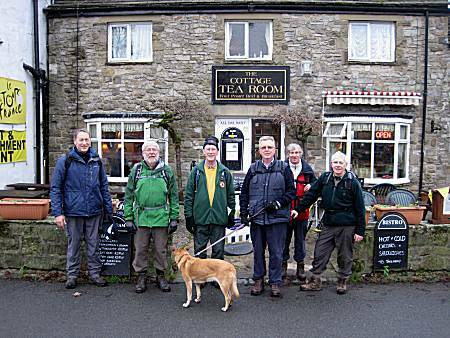 The walkers rushed to the 'Buck Inn' in Buckden to celebrate the successes of the day. Responsibly, they ordered just two bowls of chips, which were of a high quality. 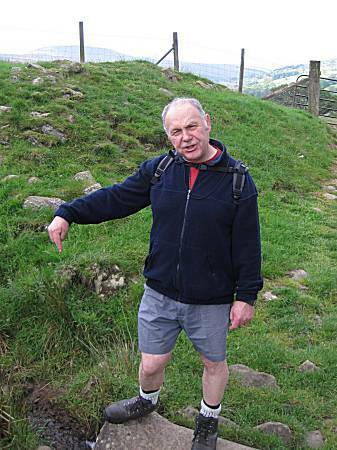 At the end of the walk, in their exhausted state, Paul received valuable assistance with his boots. 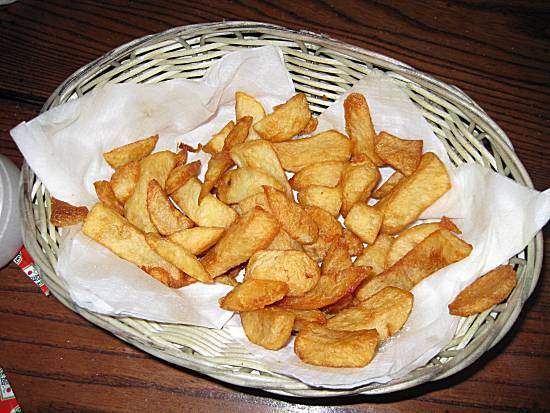 Chip Score: Perfect quality chunky chips, although expensive. Weather: Warm and sunshine all day. 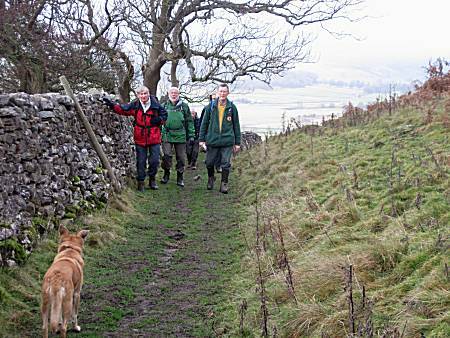 Walkers: Paul (Leader), Alan, Tom, Ron and Ella the dog. 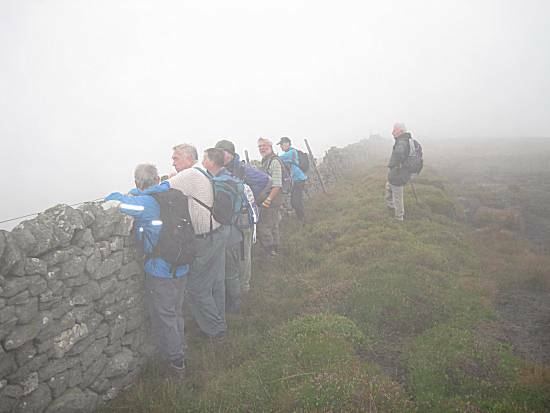 Eight eager walkers arrived at a remote location nearby Penn Hill in the dull and foggy conditions. 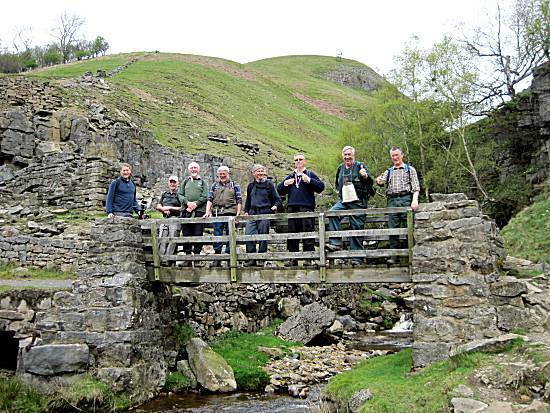 Even Cliff's excellent egg, bacon and sausage sandwiches failed to raise the spirits of the walkers who instinctively knew that this could be one of their most dangerous walks yet. 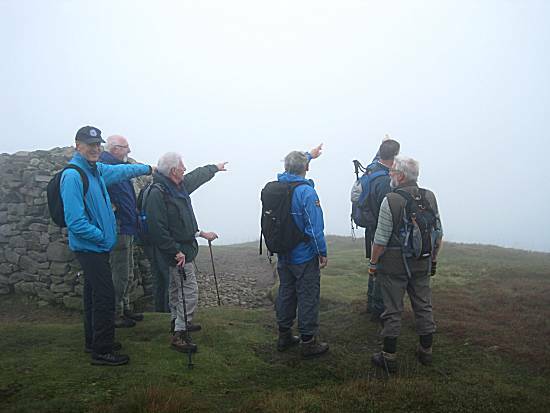 Unable to see Penn Hill they calculated a direct route to the base of the 546m hill determined to reach the summit in a record time. 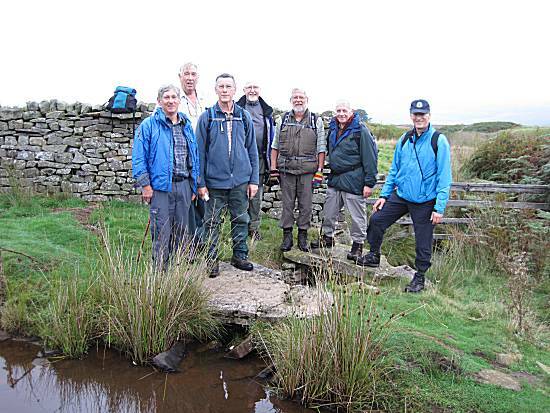 Despite the terrible conditions the walkers were pleased to reach the beacon at the eastern end indicating the summit, where they were looking forward to incredible views of Wensleydale, but were sadly disappointed. 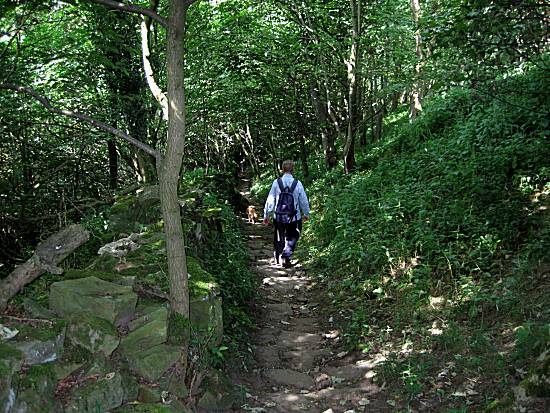 The route across Penn Hill was indistinct and the walkers feared that they would become lost in the worsening conditions. However, they continued faithfully following their leader, Paul. 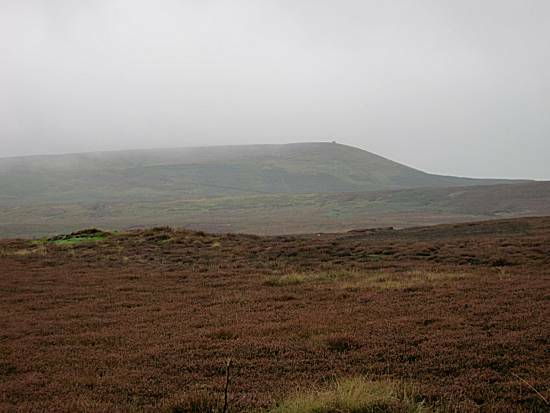 Disaster occurred as the conditions deteriorated and the walkers knew that they must quickly find the route off Penn Hill. 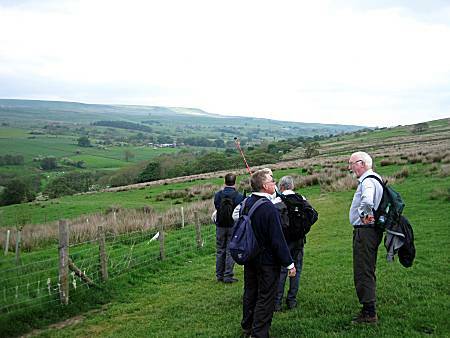 Under the leadership of Paul, he successfully guided the walkers down to safety and they gazed back at Penn Hill that had so nearly brought the walk to a rapid conclusion. 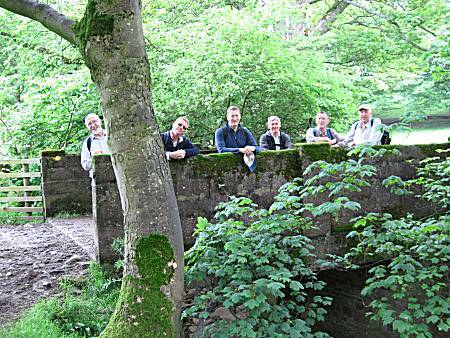 However, secretly they knew that not even the infamous 546m Penn Hill could defeat the intrepid walkers!! 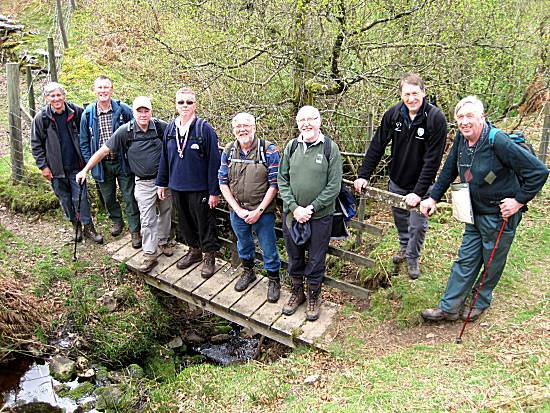 After the trauma of Penn Hill, the walkers gathered on a makeshift bridge, before breaking out and sharing their Pork Pie and Mars Bar Crispy rations. 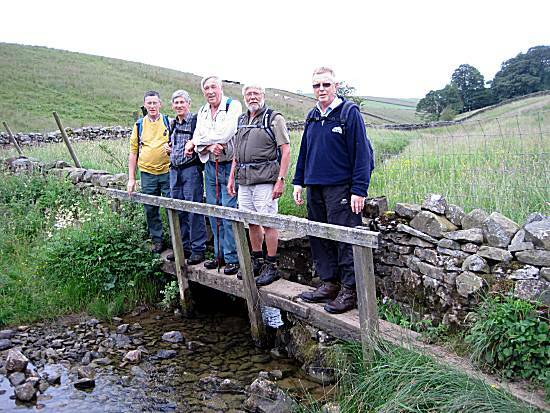 Cunningly Paul found a deviation to the route to take the walkers into Carlton, where he knew that the Foresters Arms would welcome the brave walkers. 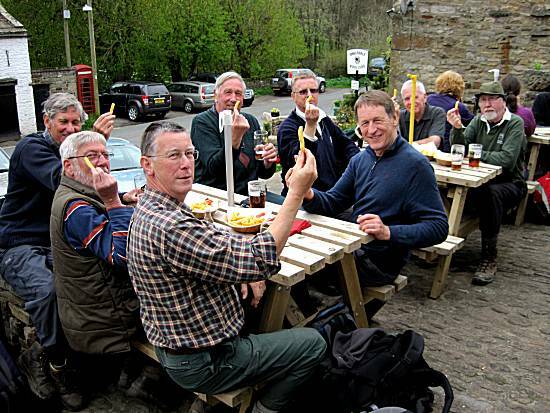 Ron joined the walkers at the Foresters Arms, where they all feasted on ale with separate portions of chunky chips. 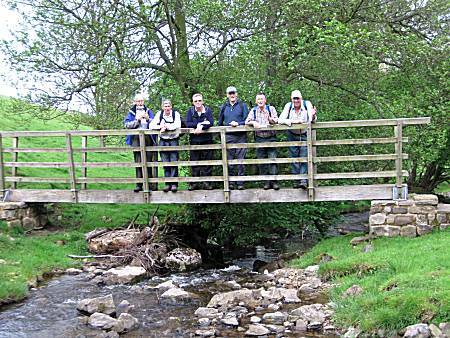 After leaving Carlton the jubilant walkers were quick to locate bridges to celebrate the successes of their day. 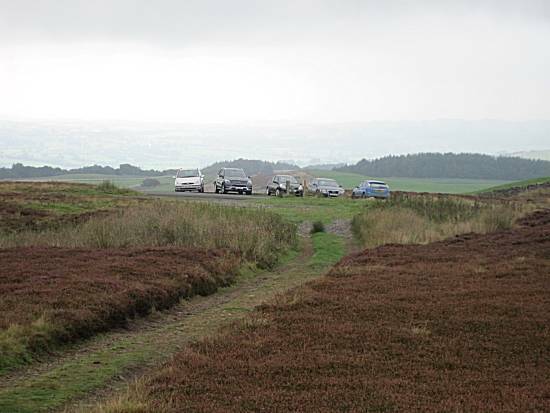 The final stages of the walk took the walkers back across the moor, until sight of their cars indicated a conclusion to their difficult, but successful walk. 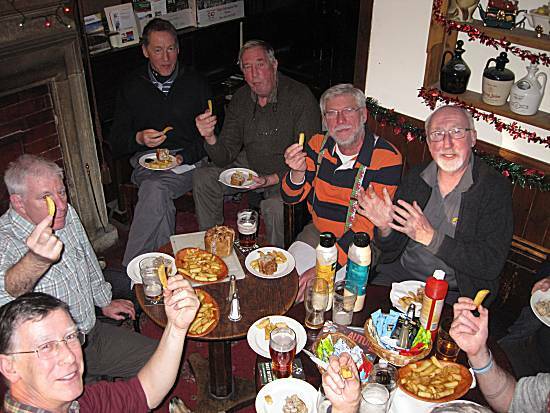 Chip Score: 9 individual portions of chunky chips, not crisp, but excellent value. 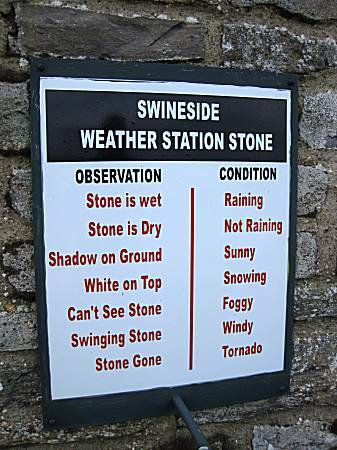 Weather: Overcast with drizzle all day. 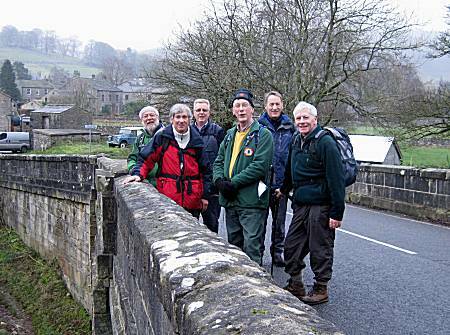 Seven walkers arrived at the small parking area close to the Devonshire Arms Hotel in Bolton Abbey in damp dull conditions, but were quickly revived by Ron's excellent egg, bacon & sausage butties. 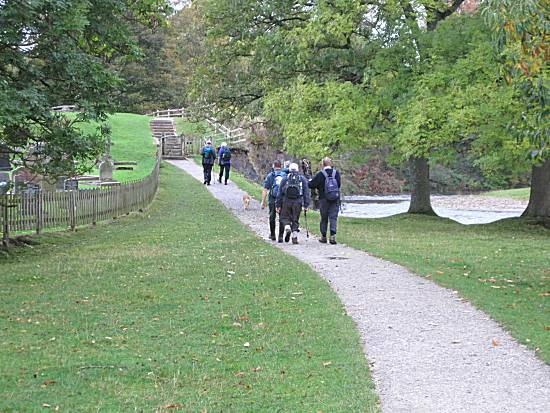 They set off, quickly entering the grounds of Bolton Abbey. 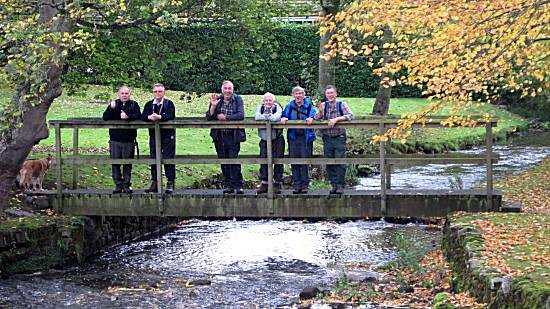 The walkers enjoyed their walk through the well manicured grounds of Bolton Abbey. 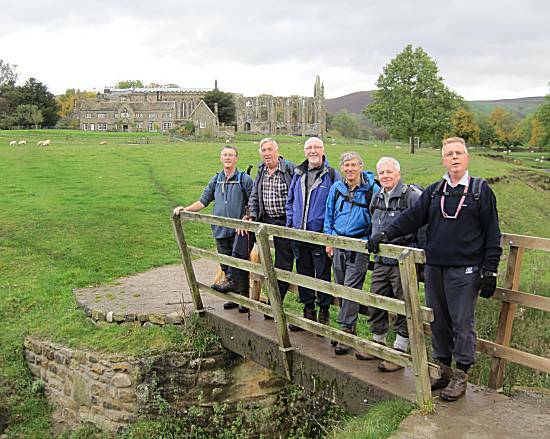 On finding the ruins of the Bolton Abbey, founded in 1154 by the Augustinian order, the walkers quickly gathered on a nearby bridge to celebrate their find. 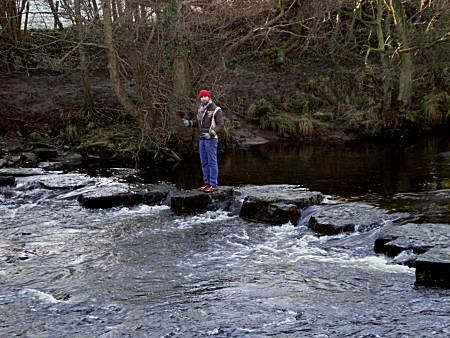 Ron was anxious to show off his superior Stepping Stones crossing ability, but was persuaded by others to abandon his attempt with the swollen river conditions. 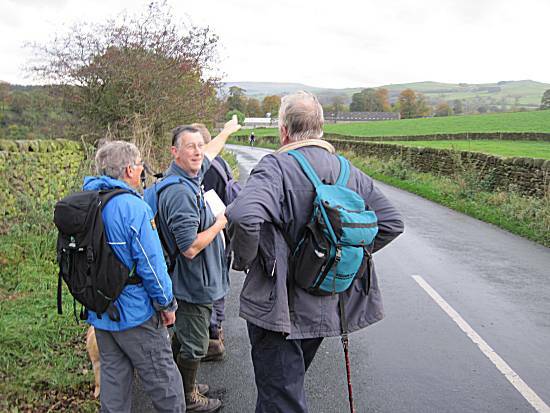 Considerable discussions took place at the side of the road as to whether they were on the correct route. 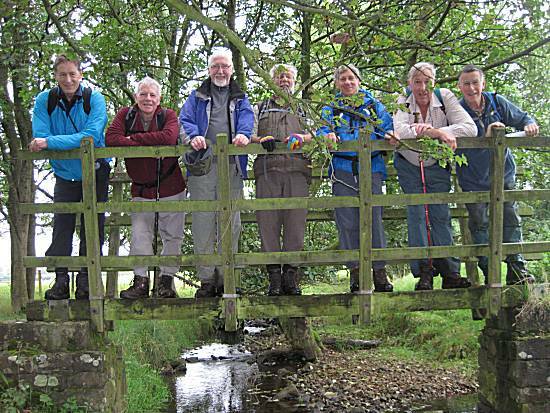 Paul declined a GPS fix and took the walkers back down the road to find the correct footpath. 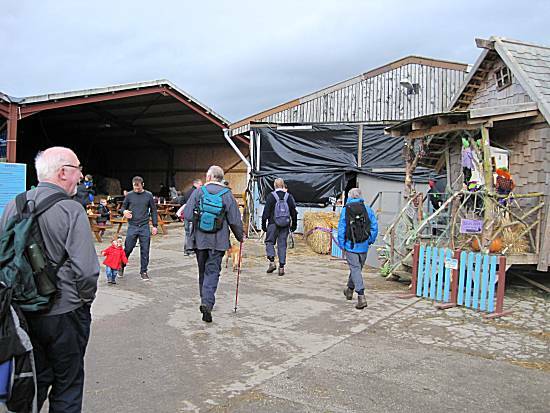 The walkers were amazed to locate Calm Slate farm, known to the locals as Billy-Bob’s Ice Cream Parlour and playground in Halton East, but declined both ice cream and an opportunity to use the extensive playground equipment. 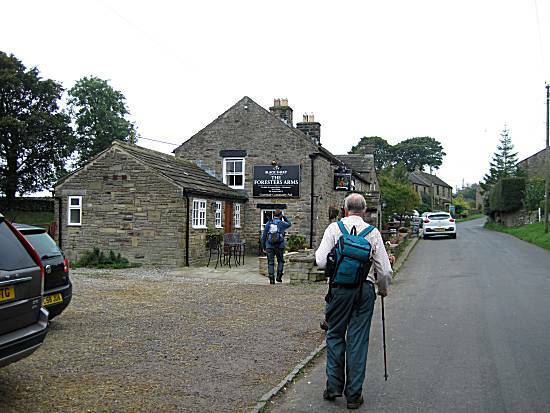 The walkers were relieved to find the Cavendish Arms in Embsay close to the railway station, where they enjoyed Goose Eye ale and portions of chips with adequate tomato sauce. 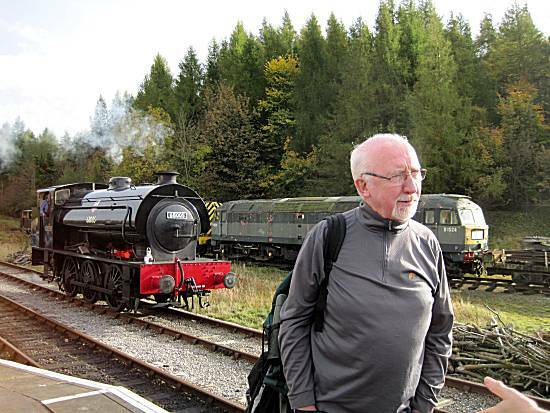 Afterwards they decided to take the steam train to Bolton Abbey station and left the Cavendish Arms in great anticipation. 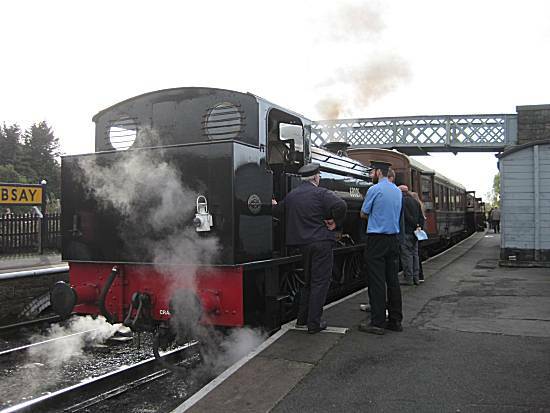 The railway staff were greatly perplexed, when they realised that the engine was attached to the train back to front and had no idea how to change it!!! 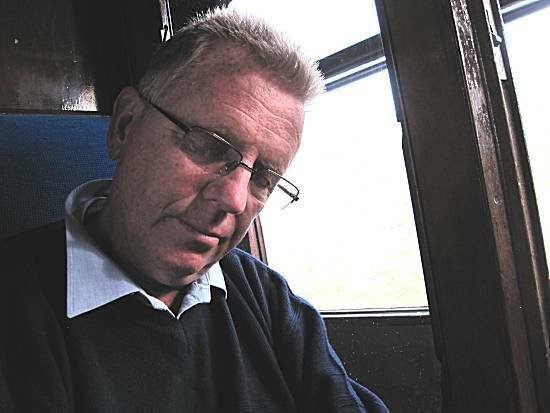 Paul with his extensive railway knowledge quickly took charge of the situation, by reversing the engine into the marshalling area, turning it and reattaching it to the waiting carriages. The railway staff were in awe of his skills and showered him with praise. 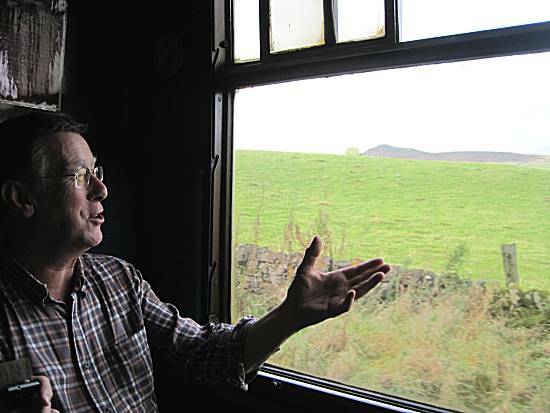 However, Paul took this in his stride, quietly taking his seat awaiting the timely departure of the train. 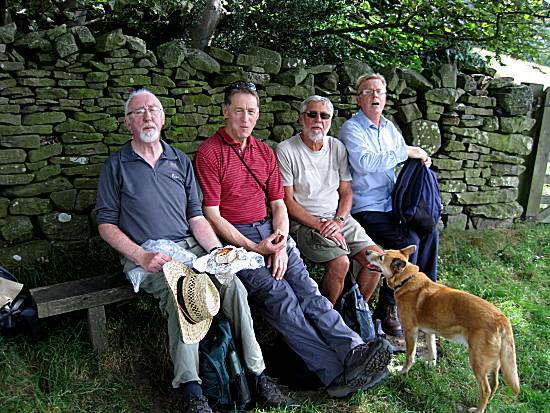 The stresses of the day took their toll on Ron during the long journey back to Bolton Abbey, but they all knew that this had become another very successful walk. 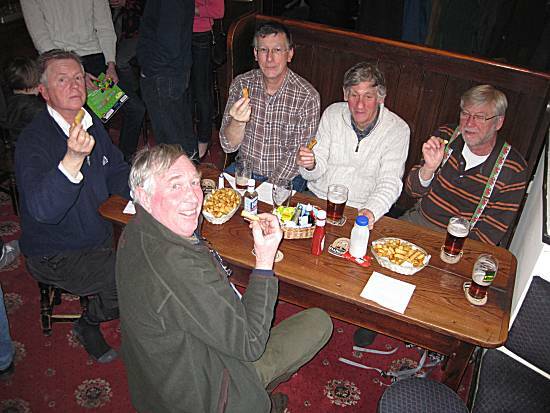 Chip Score: 5 portions of good chips, but poor value for money. 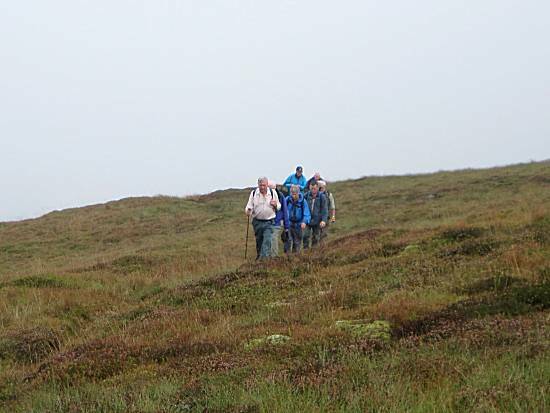 Weather: Damp and dull first thing, but soon turning into an excellent walking day and surprisingly warm for October. 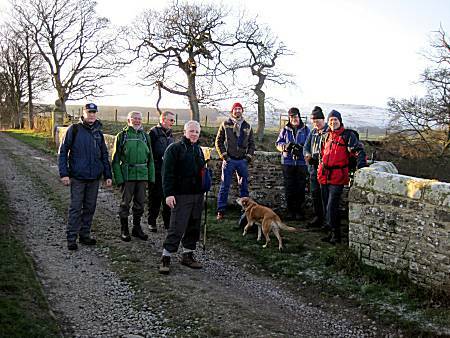 Seven walkers, plus Ella the dog, arrived at Starbotton on a very cold and crisp morning, grateful for the delicious Bacon, Sausage and Egg butties courtesy of Ron. 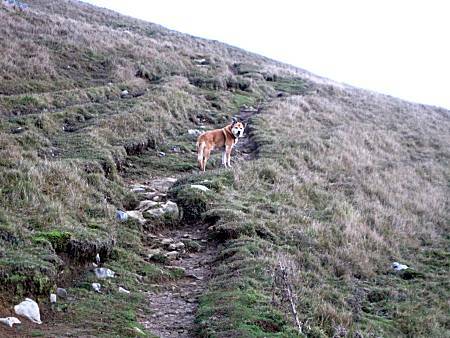 The walkers, however, became anxious when they realised that Cliff was not with them and feared that he must have become lost in the difficult conditions. 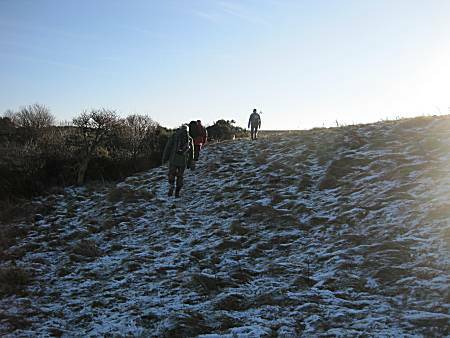 They therefore set off in search of Cliff, determined to find him before their lunchtime stop. 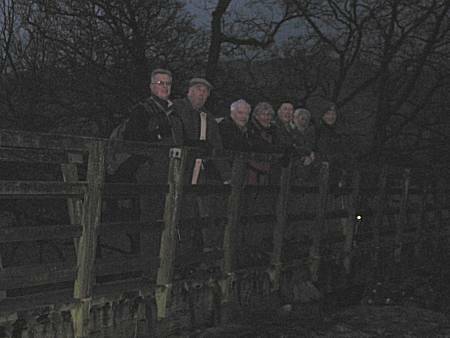 The walkers felt that Cliff must be hiding near a bridge, but were only able to locate an excuse for a bridge in the frosty conditions. 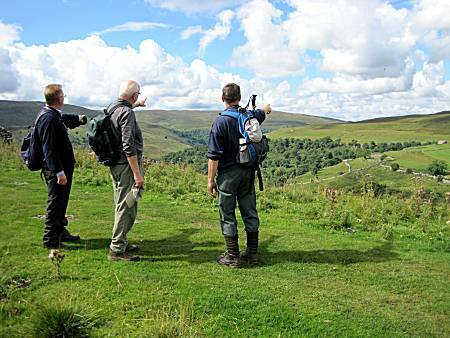 Alan had a cunning thought, when he considered that a stop for coffee would greatly improve their Cliff hunting ability. 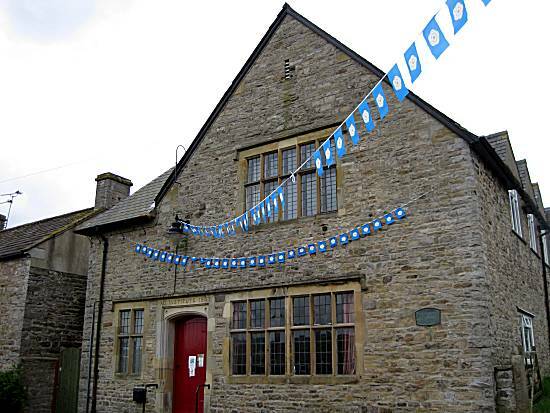 They therefore quickly located the Cottage Tea Room and ordered 7 coffees. But this was to no avail. 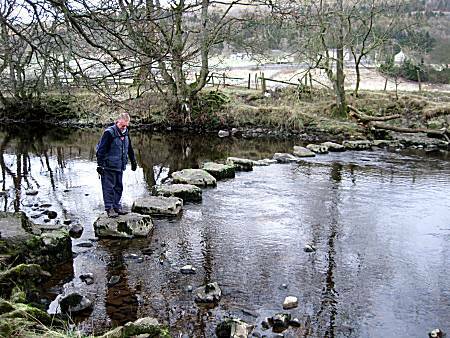 Ron then considered that Cliff must be hiding beneath the stepping stones and at great risk to himself, carefully inspected each stepping stone in turn, but still Cliff could not be located. 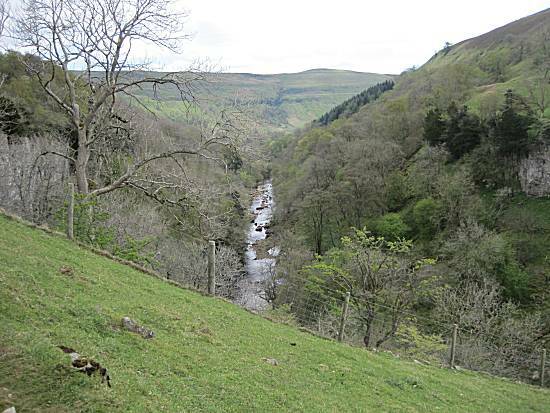 With the walkers now at a complete loss at to where to continue their search for Cliff, Ella had a cunning scheme and led the walkers deep into the hills of Littondale. 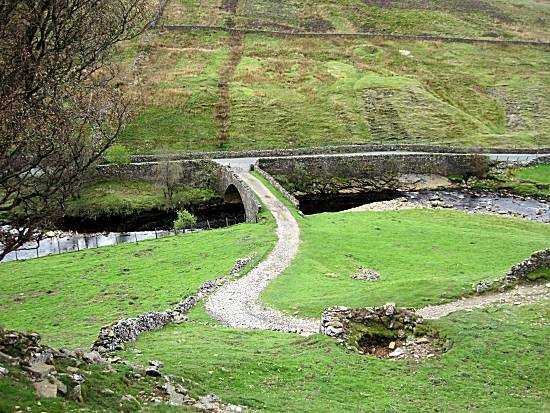 Ella became frustrated with the slow progress of the walkers as they continued deep into the hills, but they quickly realised that she was actually heading back towards Kettlewell and towards the Blue Bell Inn. 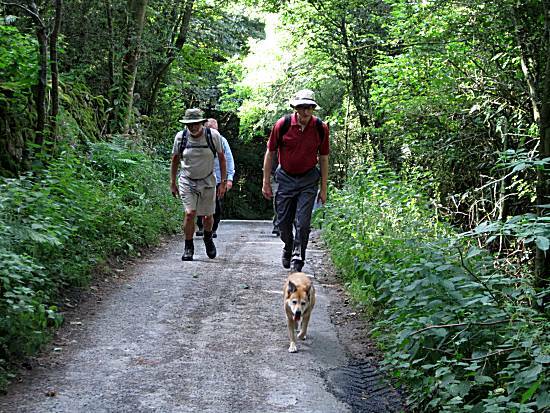 The walkers were greatly impressed by Ella's ability. Did she know where Cliff was hiding? 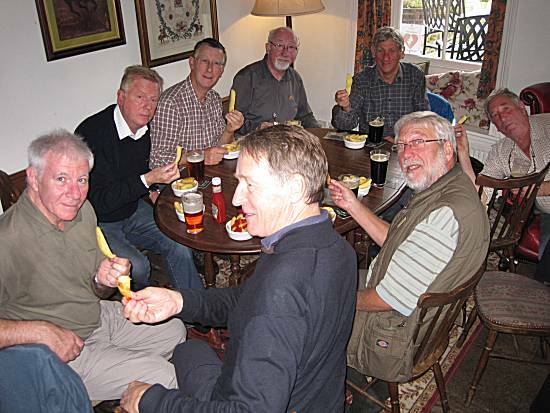 On arrival at the Blue Bell Inn, Cliff was found, casually quaffing quantities of Blue Bell Best Bitter. 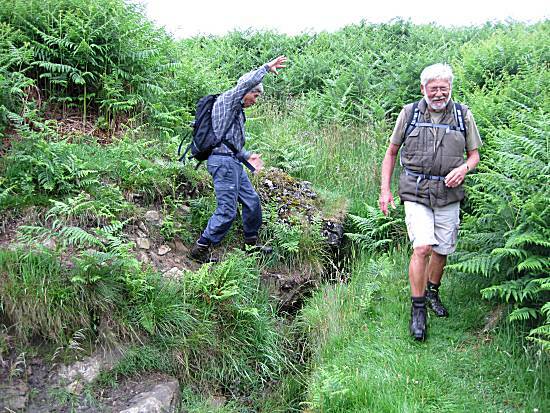 Although the walkers were relieved that Cliff was safe, they were concerned that he had gained a significant advantage over them with their lunchtime entertainment. 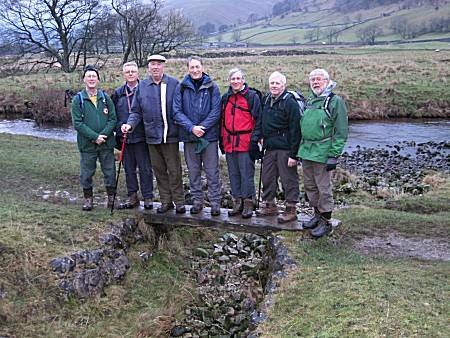 Cliff joined the walkers for the riverside walk back to the cars at Starbotton, locating several bridges on route and arriving back in the dark conditions. 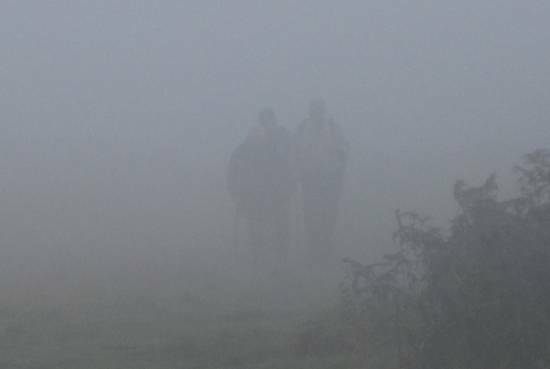 Weather: Very cold and crisp morning, turning into a misty and damp afternoon. 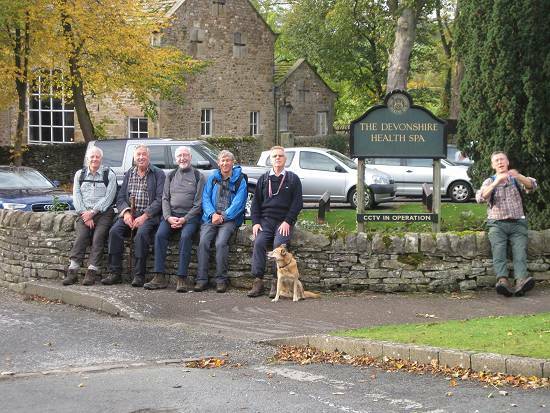 An excellent turn out of 7 walkers arrived at the regular layby on the back road to Wensley, with Tom and son Michael arriving at another layby, some ¼ mile away!!! 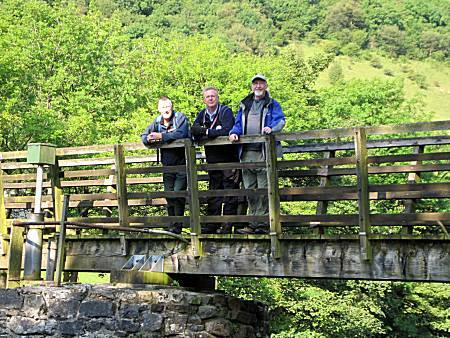 After Ron recovered Tom and Michael, he shared out excellent Bacon and Sausage butties to the delight of the walkers. 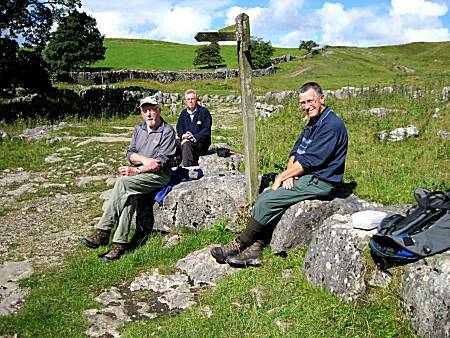 The team were advised that Cliff would join the others at their lunchtime stop, where stories of a giant pie were exchanged. 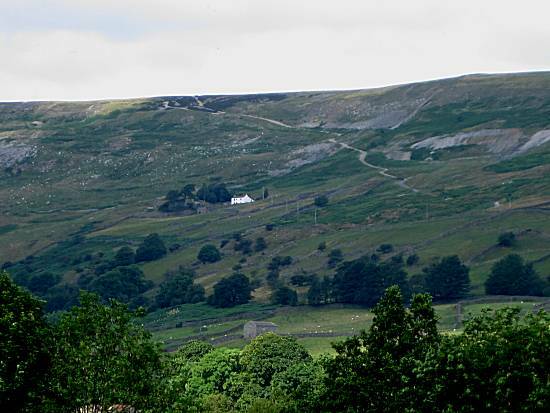 Their leader Paul, advised of dangerous and slippery conditions on "The Shawl" out of Leyburn, and therefore they wisely chose a safer, but more dangerous route passing Bolton Hall. 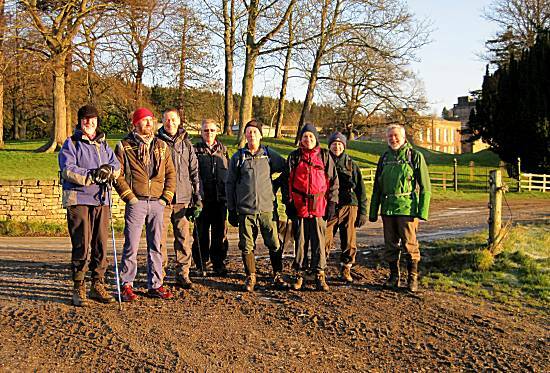 The walkers proudly posed with Bolton Hall in the background, having located it in record time. 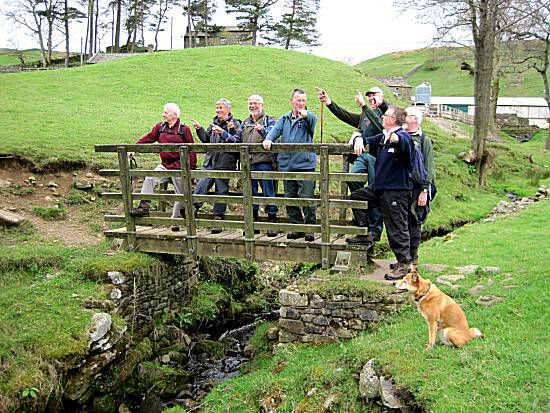 The walkers were horrified to find a wind turbine generator was just about to collapse due to immense stresses. 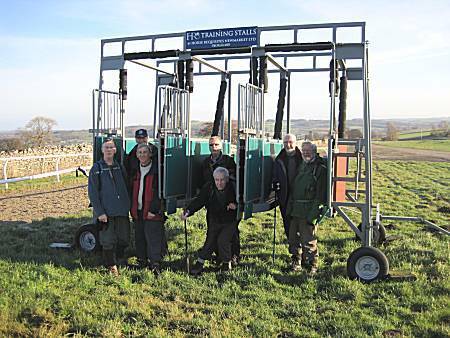 Without hesitation they commandeered a tractor and using a strong rope calculated the correct angle to counteract the forces. 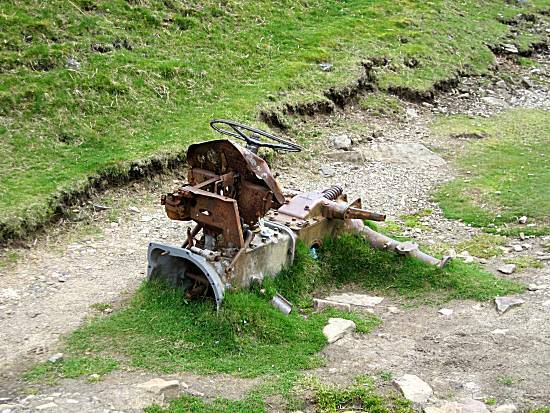 The tractor was left with exactly the right tension and the structure was saved. 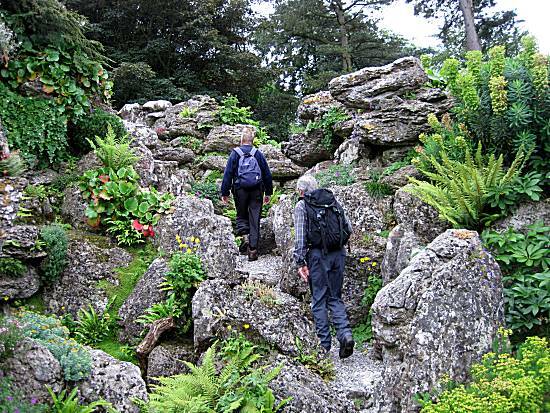 The route was long, difficult and uphill, but the walkers did not complain. 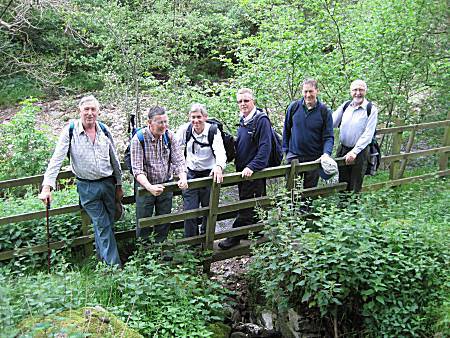 However, the walkers soon became concerned that they might not reach their planned lunchtime stop!! Ed refused to admit that he has seen a vision of naked damsels on horseback racing across the plains. The others dismissed his protestations. 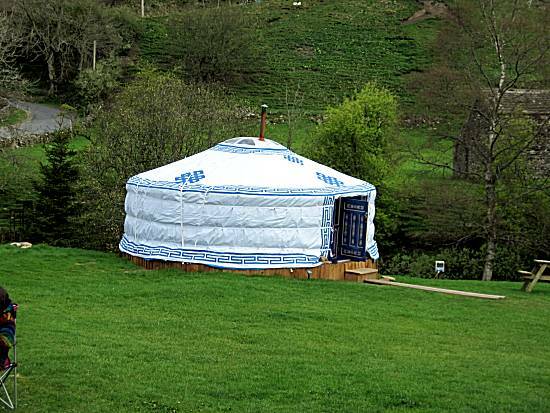 The leader considered that an element of competition would help their progress towards the lunchtime venue, but their enthusiasm was limited. 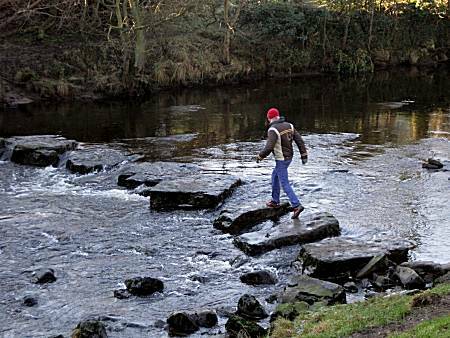 Michael was seen risking certain death by crossing the river desperately trying to save the walk by finding a shortcut. 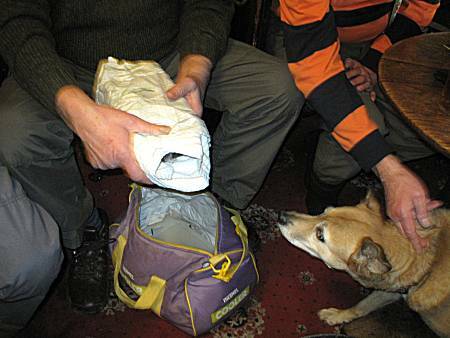 On arrival at the Coverbridge Inn, Ella was quick to locate the giant home made pork pie. 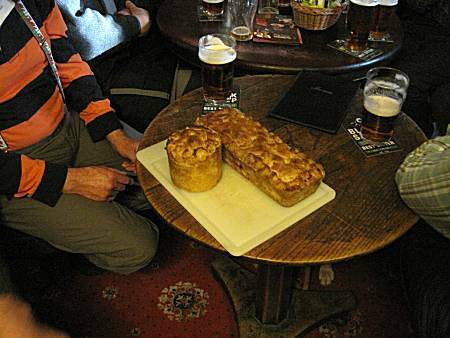 The walkers were seen feasting on Cliff's pork pie with nourishing chips, together with Timothy Taylors ale. 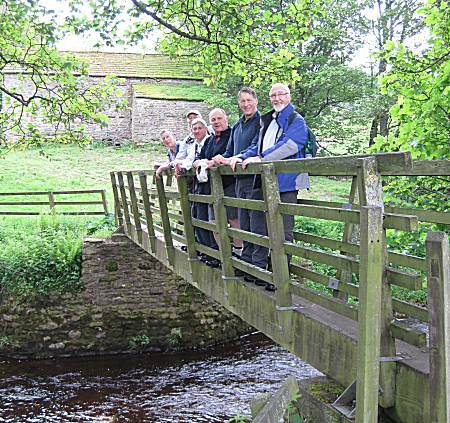 Just four walkers left the Coverbridge Inn to make the final 3 mile leg of the walk back to the cars, leaving the others to enjoy further ale and festivities. 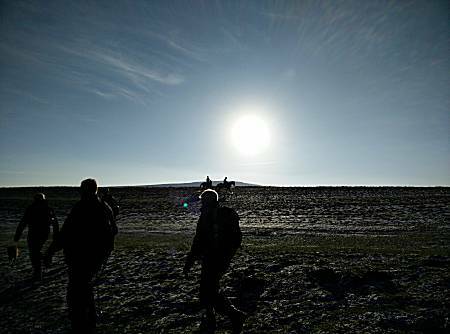 Weather: A very cold day, with frozen ground for most of the day.